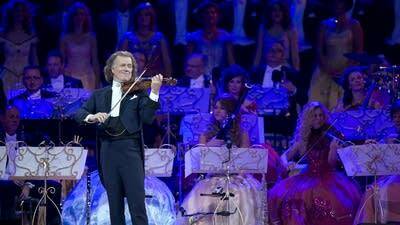 Known to audiences across the globe as the "The King of the Waltz," André Rieu and his Johann Strauss Orchestra have brought the joys of classical music to millions of listeners for more than 30 years. His dream  "to bring the waltz to the world," he says  has led him from his home country of the Netherlands all the way to Australia, the Americas and Asia. Rieu even has his eye on more distant concert venues. "I'd love to play on the moon," he says. "I've spoken to Richard Branson. If he opens his hotel there, I will be the first to perform." Audiences need not travel quite so far to see one of Rieu's concerts, however. 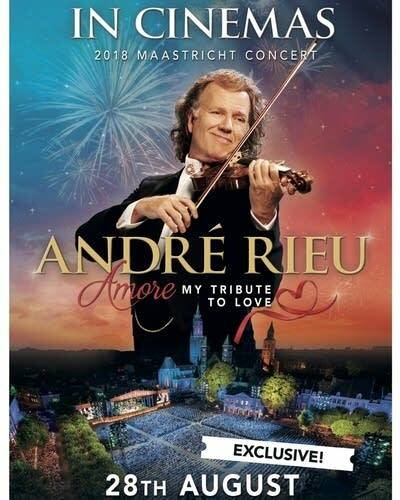 On Tuesday, Aug. 28, fans in the United States can see him in theaters across the country in a special one-night showing of his latest open-air concert, Amore, My Tribute to Love, from his home town of Maastricht in the Netherlands. The concert will feature music from his recent album, Amore, which topped the U.S. classical charts last year, as well as other famous and beloved melodies from around the world. Recorded live at the romantic, medieval Vrijthof square, the concert includes international guest stars such as Los del Rio, with their hit song "Macarena." The event also will include many surprises and behind-the-scenes bonuses. What's more, Rieu is also looking forward to his tour of the United States and Canada later this fall. "It is fantastic to be back in the USA," Rieu says. "The fans always give us such a warm welcome!" Before his upcoming 11-city tour, starting Sept. 15 in Milwaukee and including stops in New York, Chicago and Boston, we spoke to Rieu about his concert philosophy, his latest album and his perspective on his record-breaking career. "I think oftentimes the classical music world is much too serious," Rieu says. "In my concerts, everything is allowed: dancing, crying, singing, laughing. I communicate with the audience and I encourage them to have fun and open their hearts, as we do on stage. My musicians and I all love our work." 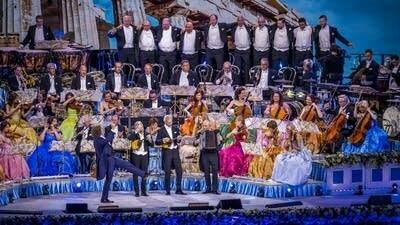 In fact, Rieu is even reluctant to call what he and his orchestra do "work": "We have fun." Rieu, who has been performing with some of his musicians for more than 20 years, refers to his orchestra as his "big family." "We share everything," he says, "our joys, our sorrows." His latest album, Amore, is inspired by his great love for his orchestral family, as well as his love for his wife and artistic partner, Marjorie, their children and their grandchildren. "To me, love is the most beautiful thing in the world," Rieu says. It is fitting, then, that his inexhaustible love for classical music should produce so much beauty on stage. "I only play music that touches my heart," he explains. "That is what keeps my love for it so fresh and constant." Furthermore, in Rieu's experience, "this love for the music transfers to the audience." He adds, "Nobody tells me what to play, and I just love this freedom to choose my repertoire together with my wife, Marjorie, who has been the most important factor in my life and work for over 40 years now." He explains that, because he picks his own repertoire, he makes sure there is something for everyone at one of his concerts: "Fun, romance, dancing, the world's most famous and beloved melodies for films, opera, operetta, folk music and, of course, a lot of waltzes." He adds that many people who find his approach to classical music melodramatic have never actually seen him perform live. "Nothing is fake," he argues. "I do not like to refer to them as shows, as … everything is real on stage." And, if the devotion both he and his musicians have for their craft wasn't already abundantly clear, he adds, "We play with all our heart." 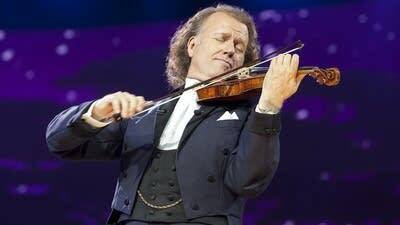 You can get your tickets to see Rieu's concert in theaters here, and view info about tour dates and locations on his website.